Last week was another good and busy week on the rivers for me and some very lucky clients. In general the fishing has been good and angling pressure low which is what every avid angler wants. 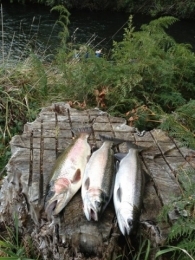 All Taupo rivers are getting good numbers of fresh spawning rainbows which are entering most nights especially after a night of rain and westerly wind.The nights have been dark over the pastÂ week and this hasÂ given good cover and confidence to fish which may have been hanging at the mouth until perfect conditions. I think the fish are still fairlyÂ small in general but are in good condition and are in good numbers most days. There are reports of a few bigger fish being caught like the one we posted on here last week but they seem to be few and far between and we did not hook anything this week which would have been over 3.5lb? These little fellas are full of fight and tear around the pool they are hooked in and in my opinion are alot more fun to catch than the last few years. I have not seen a slaby fish forÂ sometime now. 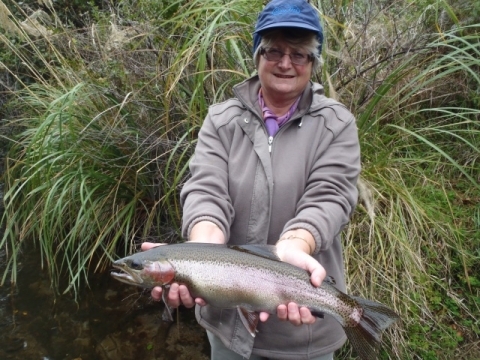 I fished the headwaters of the Whanganui early in the week and as many of you may have read on TRM website we had no issues with catching trout despite the high slightly coloured conditions. Extra water in this system canÂ mean the fishing can be challenging but our biggest problem was a few crossings which stretched the feet to tippy toes with not alot ofÂ free board.Â The fish in here are in good condition but are now starting to look for potential spawning grounds and partners as we saw quite a few fish coupled upÂ and chasing each other around pool oblivious to us standing there. The rivers of Taupo have been good but hit and miss. I haveÂ had some amazing fishing in the Hine over the past week but I have also had some hard disappointing sessions in there also. I fished with Doug and Bill early in the week and started on the Hine only to get skunked for the first few hours before we went back to the Tongariro Â and had someÂ great fishing in the middle reaches with high water conditions. The next morning I was pickingÂ up in Taupo for a day guiding so we stopped at the Hine first up an had no reason to leave as we caught fish from the second cast to the last cast at 4 pm??? Trout are moving into the Hine often but not every night leaving anglers guessing where and when to fish here. Once they are in the river they are moving like lightening and can be hard to keep up with as the river is so low and slimy due to very little flow for the past few months. I had the pleasure of guiding Ken BarlowÂ and his wife GillÂ which feature weekly in the English soap Coronation Street!!! 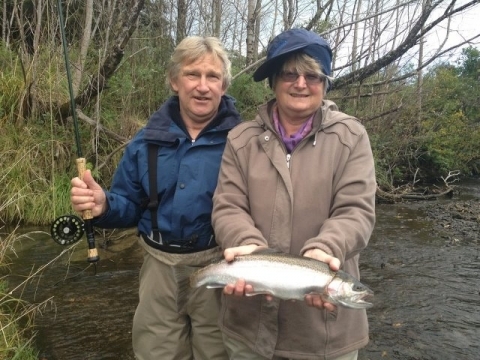 Ok….maybe not but look at this fella from Te Puke he looks just like Ken Barlow-Coronation street is my favourite show at the moment and never miss it.Â Anyway we had an amazing days fishing together on the Hine just after the first bit of rain we received on Friday night. We only fished about three runs and caught over 15 fresh trout. Merve and Gill had never fished before and had no casting skills whatsoever but had developed enough of a chuck and duck toÂ hook the oddÂ trout which were pushing through every half an hour or so. I could stand high on the bank and see groups of fish moving past the anglers every twenty minutes or so, they were not stopping at all but could be caught quite easily. This is the best day I have had this winter so far and will expect it only to get better in the next few weeks. Funny enough I could’nt get one to take the glo bug? infact they seemed to shy aways from the brightly coloured fly and were happy enough grabbing the bomb or a simple hare and copper with a piece of flash tied into it. The river mouths will be worth a look in the next few days when the wind drops and allows anglers to fish the drop with boobie style flies.